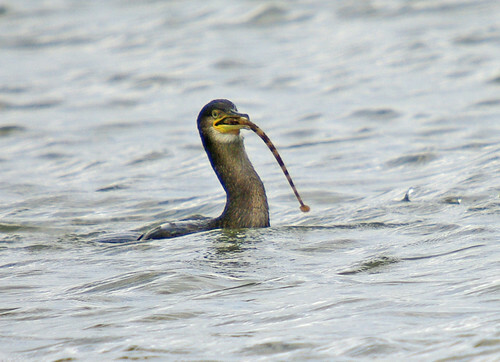 Cormorant with pipe fish read about it below. With the promise of a nice day and the report of a few nice birds at Dawlish I climbed onto the bike at around 10 with the sun shining and a bit of excitement bubbling inside. My enthusiasm was partly dampened as the early morning sun was replaced by dirty black rain clouds yet again. It held off though and in between the clouds the sun came out now and again to lighten not only the sky but my mood and enthusiasm! Once at the Warren I started the long haul towards the beach and and dunes. The tide was coming up but it was going to be a "small" tide and the birds, I was informed by regular Wareners were unlikely to be on the beach in great numbers. Never the less I decided to walk the long way around to the point in the hope that I may bump into Sanderling, Ringed Plover and who knows what else. The Sanderling were obliging and I noticed a couple of birds on the wave line. I took up position and snapped away. Good views and shots with the sun obligingly brightening the birds and reflecting in the eyes beautifully. I lay horizontally on the sand and inched forward to them on my elbows feeling slightly self conscious as a group of people walked towards me seemingly oblivious to me and the scene before them ............ that is a 58 year old bloke laying on the beach with his camera pointed at something. Trying not to scare the two very obliging Sanderling away, I gestured to the 3 people to walk around so I could continue my photography. With that the older man, a particularly dim witted old man at that, not only ignored me but walked even quicker to me as I rose to my feet with the birds disappearing towards Sidmouth or perhaps even Portland by now ....thats 50 miles away by the way! "What are you taking photos of" he innocently , or some would say, stupidly asked. "Well them". I said pointing to the distant specks.. Oh, he said "I wonderded". "Didnt you see me trying to stop you" I said, "No I wondered who you were waving at was his reply". He said that the crawling would do me good!!!!!!!! I suggested that he might like to walk along with his eyes open and then he might be able to enjoy his surroundings a bit more. Quite a funny story really, I just hope that when I am in my 70s and older, I can keep my brain in tact! 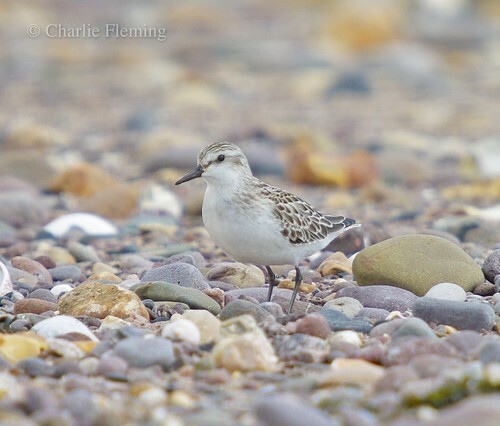 Anyway not too much damage done because I took these two great photos of the Sanderling. The last few days have been really good here for waders and I have been so busy taking photos of them and then sorting through that I have not been able to up-date the blog, only so many hours in a day. Firstly there was the lovely little flock of Knot. Some in adult plumage they were very easy to photograph and I have included one of the best ones here. They are very subltle in colour with greys and beige and very pretty white scalloping to every feather. They were just resting on the beach. 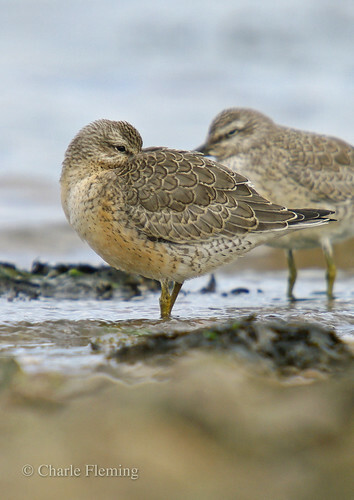 Then there was the Semipalmated Sandpiper. It is a pretty little bird though. I wonder where it will end up, probably migrate with the Sanderling that it seems to associate with anyway. 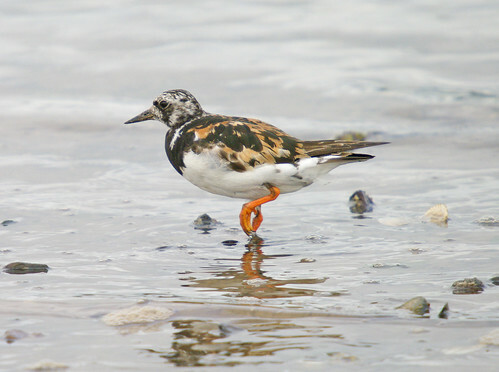 These are a very very nice little wader and yeterday as I made my way back to the main entrance of the Nature Reserve I saw them on the beach at low tide. I made my way to them and knowing that they are as confiding as they are got really close for photos and here is the best of them. Well thats my opinion. I have posted lots of photos on my Flickr galleries so please just click on the link here and have a look at them, its dead easy, go on try it! But also click on theses thumbs to see a bigger image. The Sanderling were feeding on the little shrimp amongst the sea weed and they seamed to be very successful because I saw them with several chunky shrimps. They were very excited every time they caught one chasing each other around to grab it. So this last week or so we have had Slavonian Grebe, Osprey and Semipalmated Sandpiper, what's next I wonder. Well a Wryneck was on the Warren yesterday and the day before. I didn't see it or take part in the inevitable scrum that ensues anytime something rare is about. Most people I bump into out and about are really nice but there are some very pompous arrogant people who are very annoying. Like life in general, good bad and ugly!